A beautiful, powerful new novel from the bestselling, award-winning author of Sister of My Heart and The Mistress of Spices about three generations of mothers and daughters who must discover their greatest source of strength in one anothera masterful, brilliant tale of a family both united and torn apart by ambition and love. The daughter of a poor baker in rural Bengal, India, Sabitri yearns to get an education, but her familys situation means college is an impossible dream. Then an influential woman from Kolkata takes Sabitri under her wing, but her generosity soon proves dangerous after the girl makes a single, unforgiveable misstep. Years later, Sabitris own daughter, Bela, haunted by her mothers choices, flees abroad with her political refugee loverbut the America she finds is vastly different from the country shed imagined. As the marriage crumbles and Bela is forced to forge her own path, she unwittingly imprints her own child, Tara, with indelible lessons about freedom, heartbreak, and loyalty that will take a lifetime to unravel. In her latest novel, Chitra Banerjee Divakaruni explores the complex relationships between mothers and daughters, and the different kinds of love that bind us across generations. Before We Visit the Goddess captures the gorgeous complexity of these multi-generational and transcontinental bonds, sweeping across the twentieth century from the countryside of Bengal, India, to the streets of Houston, Texasan extraordinary journey told through a sparkling symphony of voices. Selected as one of the titles to be honored on the 2017 Amelia Bloomer List.
" 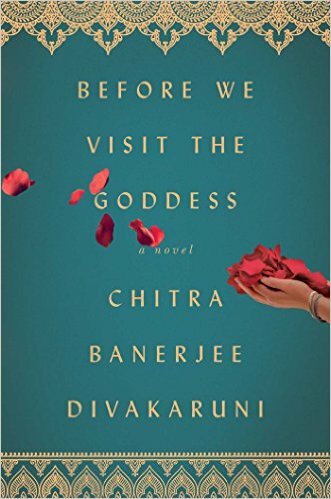 Before We Visit the Goddess is universal - a story of mothers and daughters, misunderstanding and sacrifice, success and independence. . . . [A] sweet, piercing blend that - like sugar, fruit and saffron - forms a dazzling, memorable novel."